Are you ready for a real bike rack for your family’s mountain bikes? Tired of your mountain bikes getting scratched or damaged during transportation? 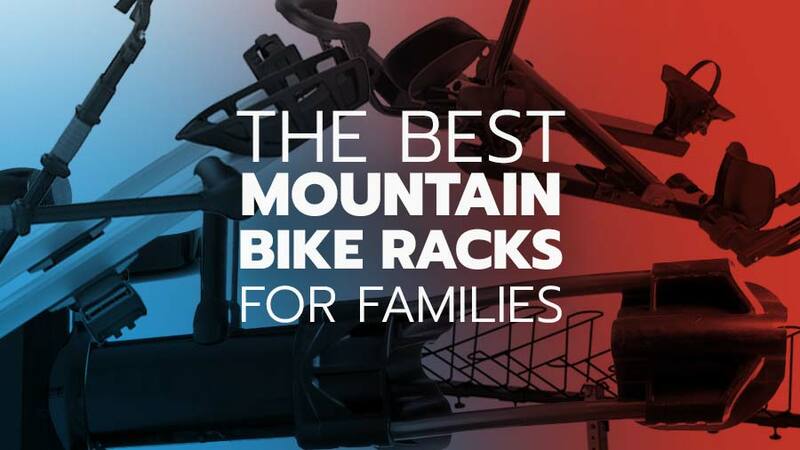 In our opinion, these are the best bike racks for mountain biking families because each option holds 4-6 bikes; they all require a 2-inch trailer hitch and depending on how you arrange the bikes, they should not be touching each other. This results in safe, secure, damage-free transportation. 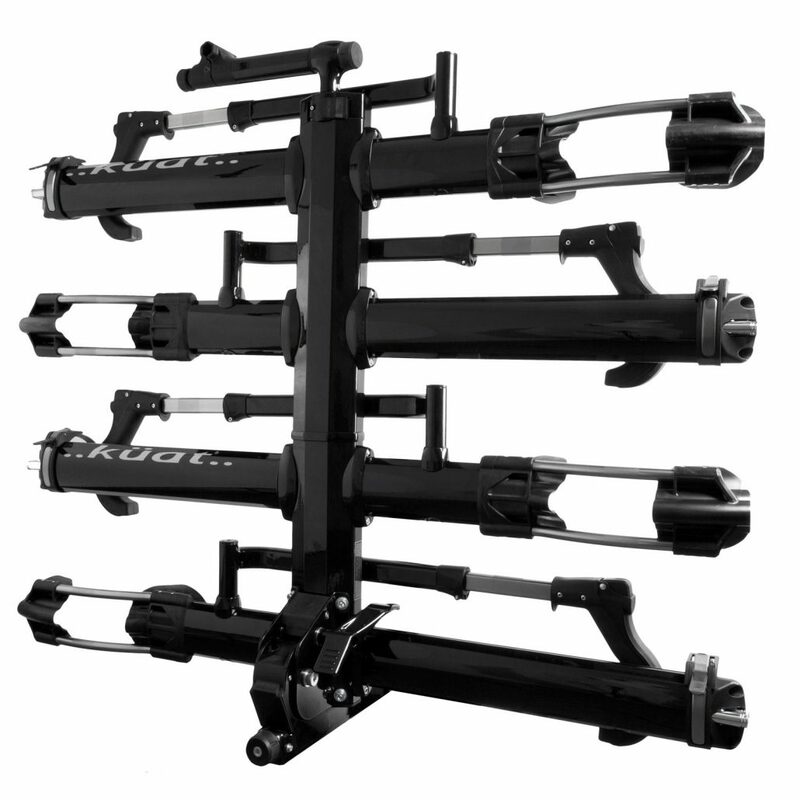 The Kuat NV 2.0 is a bicycle rack that’s designed to be both stylish and durable. The original rack holds a total of two bicycles, but with the add-on option, it can handle up to four. 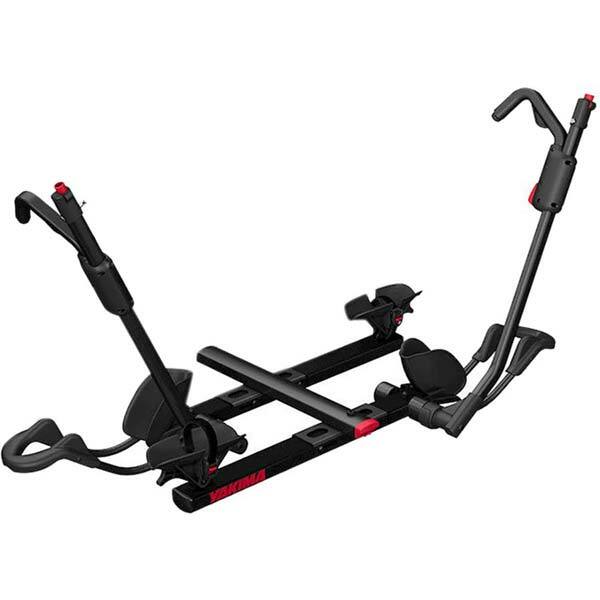 This rack has an adjustable front tire cradle system, meaning that your front wheel won’t be dangling in the air or spinning around while your vehicle is in motion. This keeps your mountain bike extremely secure. The rear wheels are held in place with a strap. On top of this, it has a foot assisted pivot system. All that you need to do is tap the pedal on the bike rack, and it will automatically pivot downward, making it simple to remove the bicycles. 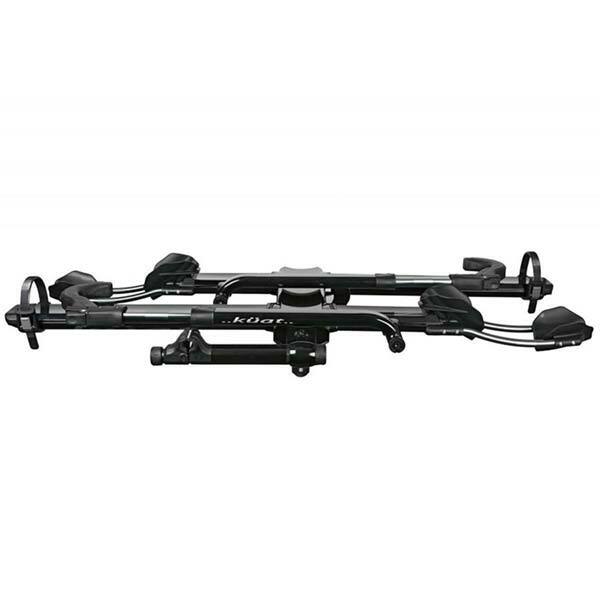 The rack itself mounts onto your vehicle’s trailer hitch with the included hitch lock and hand tight cam system. The cable locks, which lock your mountain bikes onto the rack are fully integrated into the device. Basically, your bikes aren’t going anywhere, until you loosen the locks by hand and remove them. If matching your bike rack to your vehicle is a priority, then you’re in luck. The Kuat NV 2.0 comes in two different colors: gray metallic with orange accents, and black metallic with gray ones. The frame is made from metal, and the entire rack (the original without the add-on system) weighs a mere 52 pounds. Overall, the Kuat is designed to hold bicycles that have a tire diameter of between 20 and 29 inches, although a separate adapter is needed for the ones that are between 20 and 24 inches. 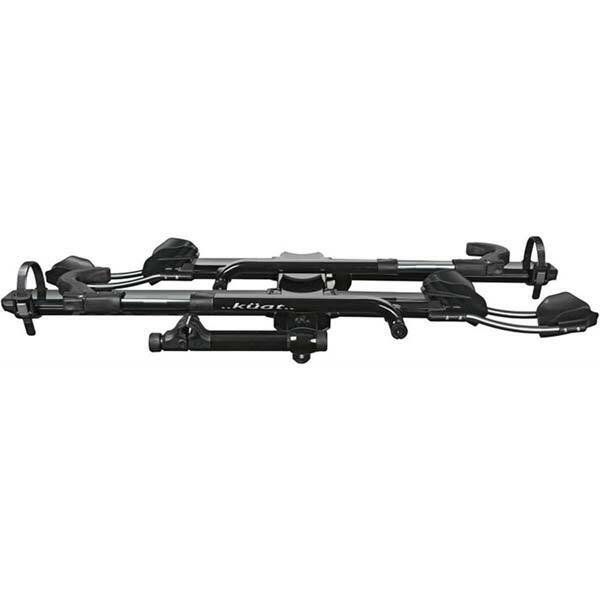 The Yakima HoldUp calls itself the “serious bike lover’s rack.” This seems to be the case, as this mountain bike rack boasts that it only takes seconds to load and secure your bicycle to it, no matter the size of your wheels. It’s designed to help you cart around bicycles of all types with wheels that are between 20 and 29 inches, no adapter needed. It can also hold models with disc brakes, full suspension, and through axels. Really, there’s not much that it can’t handle. The main model of the Yakima HoldUp securely holds two bicycles in place while you’re on the road, thanks to its SKS lock system. There’s an additional adapter called the HoldUp + 2 that attaches to the initial rack, allowing you to double its capacity. No matter which model you have (the initial HoldUp or one with the add-on connected to it) you can adjust the amount of space in between the bikes to keep them from bouncing into one another as you drive from one location to another. 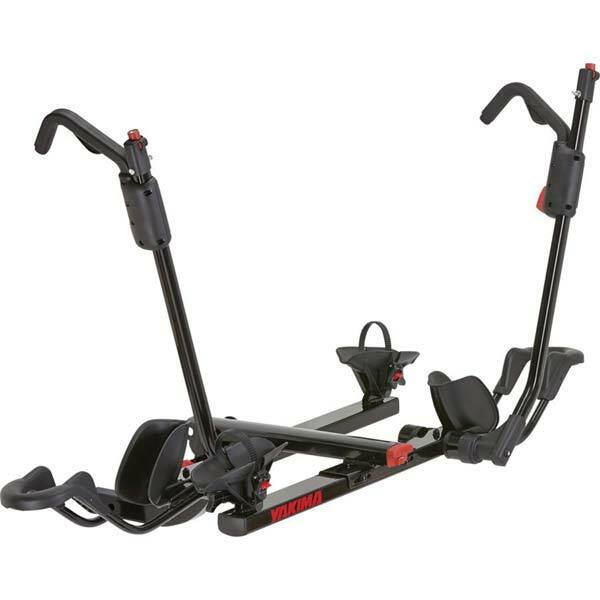 The Yakima HoldUp comes in black with red accents and attaches to your vehicle’s trailer hitch. 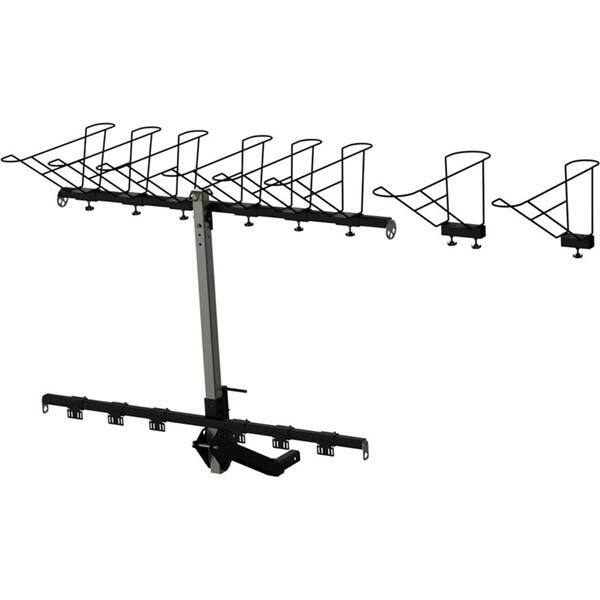 When you’re ready to load and unload, the rack tilts downwards to make this a breeze. You won’t have to lift the bikes over your head, potentially injuring yourself or scratching the bike, while trying to move it. Once you’re done using it, the entire device folds up and stays out of the way. 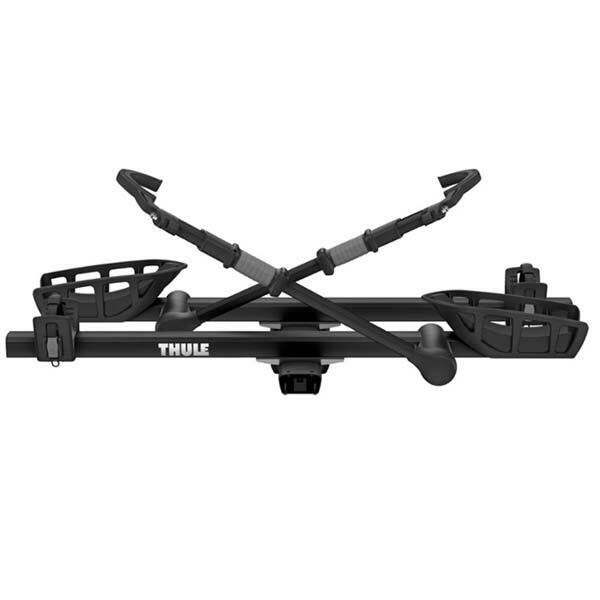 The Thule T2 Pro XT bills itself as a “pro” level rack, and it certainly lives up its hype. It’s a platform hitch rack that has a frame-free ratcheting arm. If you’re worried about your rack putting pressure on your bike’s frame, then this is the one for you. It holds the bikes by the tires, and even adjusts so that you have plenty of clearance between the two bikes that the initial rack holds. You can always choose to upgrade the system with an add-on that allows for two additional bicycles. 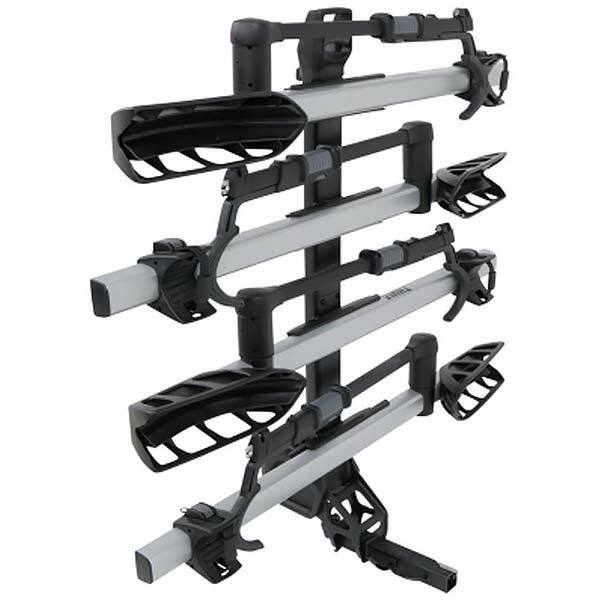 This mountain bike rack weighs a mere 52 pounds when empty, and comes in a solid matte black. This ensures that it will match any vehicle. You don’t have to worry about your vehicle’s color clashing! The Thule was designed to accommodate many different types of bikes. It can handle mountain bikes, as well as downhill and fat bikes, as long as the wheels are between 20 and 29 inches in diameter, and no more than five inches wide. The patented HitchSwitch lever makes it easy to get the bikes on and off of the rack. All that you need to do is press that lever, and it will tilt downwards for easier access. 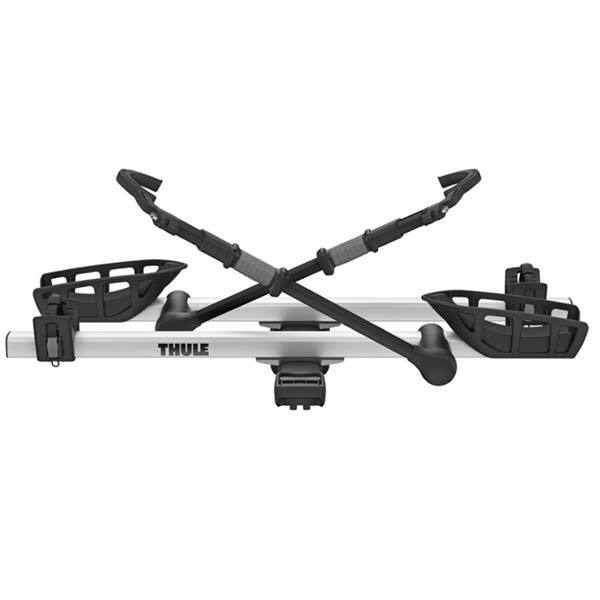 Plus, you don’t need to use any tools in order to install the Thule T2 Pro XT on the back of your vehicle. The AutoAttach system is just as simple to use as the entire rack itself. If security while in motion is a concern, then you certainly don’t have to worry about it with this mountain bike rack. It comes with an integrated cable lock and lock knob, both of which keep every in position no matter how bumpy the road is. This mountain bike rack is different than the other options in this article as the Alta Six GPR is a vertical bike rack. It can hold up to 6 bikes very well. The front wheels of your bikes are nested and secured in baskets. The rear wheels are secured against a horizontal metal bar. We had the opportunity to test one of these and could see why this style of bike rack is becoming more popular. 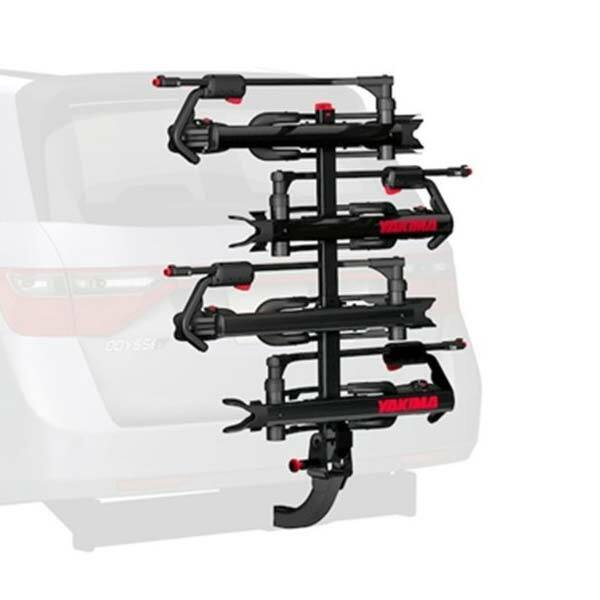 Read our Alta Six GPR bike rack review and see if this is the winning solution for your mountain bike family.